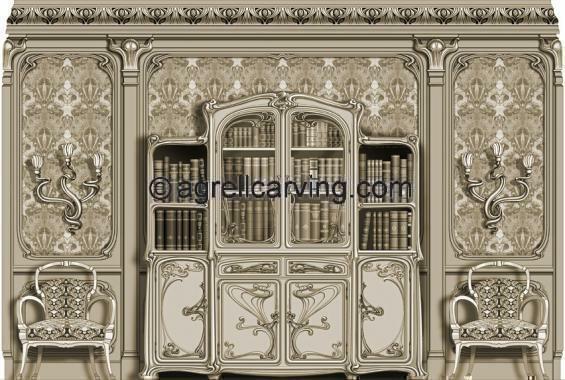 Description: Nouveau room North elevation with cabinet, doors, chairs, cornice, capitals and sconce - designed by Agrell Architectural woodcarving. See other elevations by searching "Nouveau Room"
Description: Nouveau room South elevation with settee, sofa, capitals, stained glass and cornice designed by Agrell Architectural woodcarving See other elevations by searching "Nouveau Room"
Description: Art Nouveau room East elevation with bookcase, chairs, cornice, capitals, sconces, designed by Agrell Architectural woodcarving. See other elevations by searching "Nouveau Room"